“An Empty Place at the Table” ceremony will take place to honor people with ties to UCF who have lost their lives due to intimate partner violence. The UCF community will honor the lives of domestic violence victims during the Light Up The Night event on Monday, Oct. 2, in the Pegasus Ballroom of the Student Union. The event will start at 6 p.m. In its 10th year, the event is hosted by UCF Victim Services every October in conjunction with Domestic Violence Awareness Month to encourage people to discuss the dangers of relationship violence and to share resources for support. This year’s event will feature personal stories from survivors and lessons learned from professionals in the field. 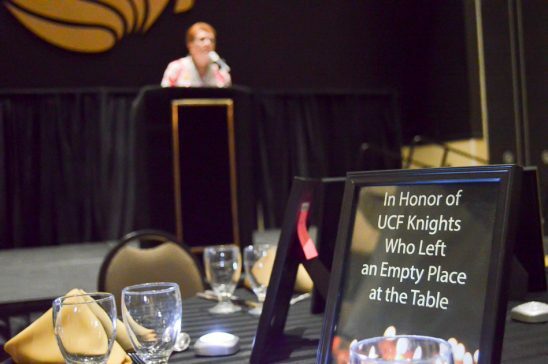 During the program, “An Empty Place at the Table” ceremony will honor people with ties to UCF who have lost their lives due to intimate partner violence. In addition, campus and community organizations will have tables at the event to share resources and answer questions. For more information about Light Up The Night, contact UCF Victim Services at 407-823-2425. If you or someone you know is being impacted by domestic violence, contact Victim Services at the 24/7 Advocacy & Support hotline at 407-823-1200.